Conical shaped Samovar with double panels and flutes on a self-footed circular base. Gadrooned upper rim. Folkloric vertical handles and spigot key. Awards issued in 1888. 5 Medallion seals for Design and Exhibition. Stamped with Russian Imperial Double Eagle. 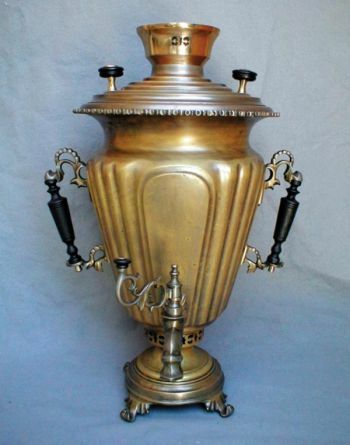 Maker: Steam Samovar Factory of Heirs to Vasiliy Stepanovich Batashev - City of Tula.